"This business with the signs started in 1912 when George V said he would like to see every village in the country with a sign of its own. The first thing I do when I get a commission is to research thoroughly the history of the village from libraries and parish records to find out as much as possible.Then I draw up a design and send it back to the village for their consideration before starting work." When he was asked to make our sign, Mr Carter thought of what made Welney - water, washes, wildfowl and windmills; then of winter, with ice and skaters. So he incorported those things into his design. Then of course his thoughts turned to Welney's greatest benefactor, William Marshall, and his initials, carefully entwined, were added. The villagers liked the design and and gave him the commission. 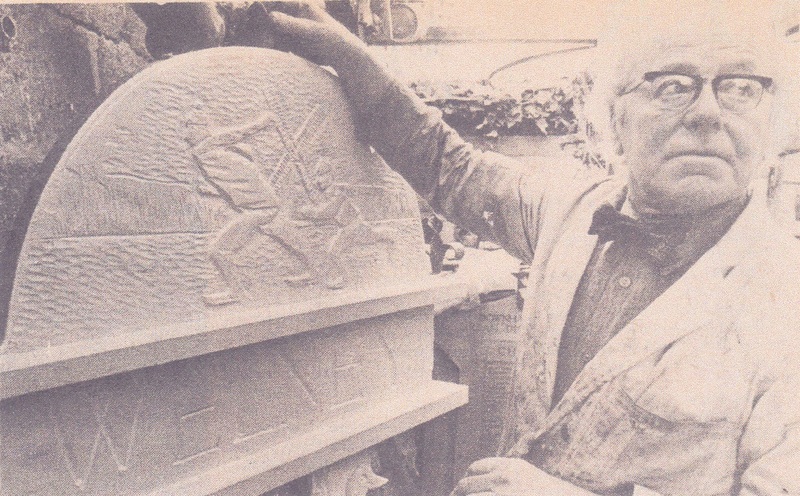 Here is Mr Carter with the unpainted carving in 1978. All his famous signs were hand-carved from solid oak and intended to last for ever. For Harry, carving was a passionate hobby and he charged only for the cost of the materials, making his unique signs incredibly cheap. 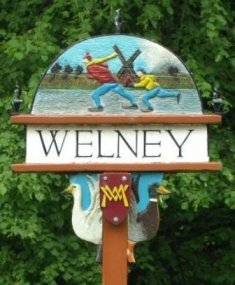 The villagers of Welney raised £100 for their sign with a series of draws and competitions. At the time of the interview, there was a problem - West Norfolk District Council had not yet granted planning permission for the sign to be erected. The plan was later approved and the sign was placed in Main Street just by the entrance into St. Mary's Church. By 1993 the sign and paintwork had deteriorated to the extent that the Parish Council decided it needed restoration. The work was awarded to Turner & Sons of March at cost of £209. A local resident, Mr Trevor Bray, generously donated £120 towards the cost. In 1998 the sign was photographed by (I believe) Ian Warrington, then living at Laburnum Cottages not far from the Church, for use on the cover of the Parish Appraisal from which the image on right was taken. 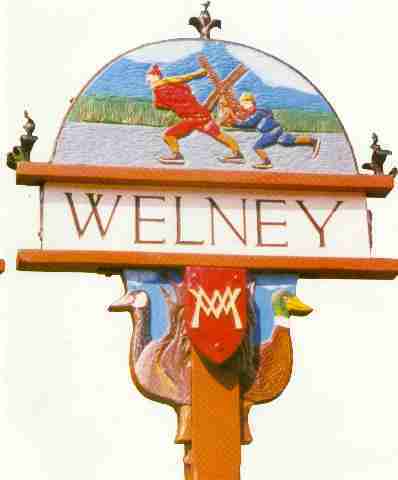 This image was used for many years, with permission, on the headers of this website and on the cover of the Welney News magazine. Further works were carried out about 10 years later, with some change of colours. The post was also turned 90° to face the road. Compare the differences. I think this version is more pleasing to the eye, but why were the retaining bolts not painted red as previously? The photo on right encircled in white has been the logo of this website since 2008, see top of page. 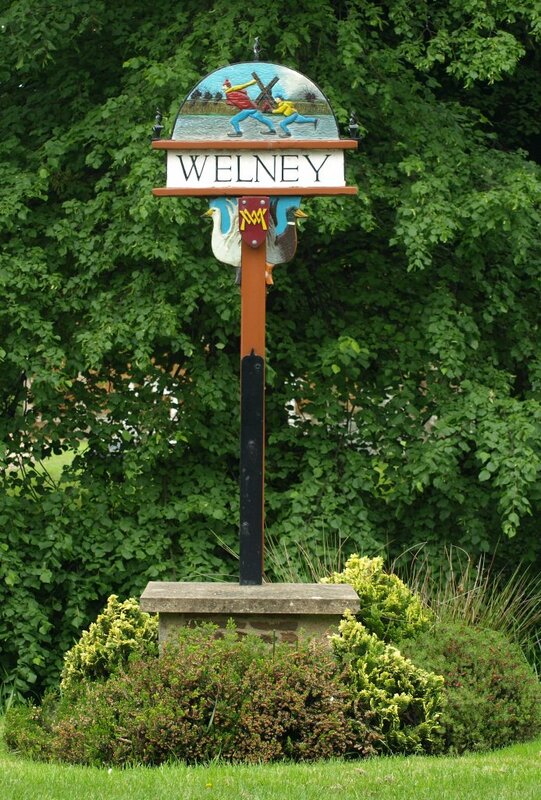 The logo was used without permission on the Welney Parish Council's new so-called "newsletter" in December 2014. The Webmaster's requests to the Council that this should not be used again, and that the editor (Cllr. Bombata) of the so-called "newsletter" should apologise, have not been answered.